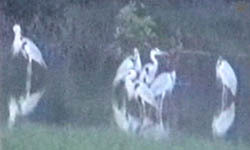 Gray herons (Ardea cinerea), Kuala Selangor. Note: scientific names of some species shown on this page are missing or uncertain. I'll appreciate any expert advice on their identification. Malaysia is a wonderful place. Of all countries in tropical Asia, it was the only one to succeed in combining economic development with preserving large tracts of rainforests. Kuala Lumpur, the capital. Both Peninsular Malaysia and Malaysian Borneo have well-protected and easily accessible national parks and Nature reserves, sometimes very close to cities. Although the country has its share of environmental problems, and endless oil palm plantations don't look much better than "rice deserts" of China or India, its ecology is in much better shape than almost anywhere else in Asia. Birds of Malaysian city parks, left to right: Artamus leucorhynchos (mother with brood, two photos), Chloropsis sonnerati (at feeder, two photos), Merops philippinus, Irena puella (two photos). they mostly live in remote places. 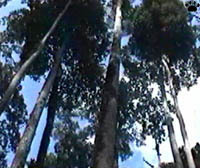 Taman Negara. People of Malaysia are very friendly and well-educated: even in the remotest village someone always speaks good English. Tourism industry is well developed, but almost free of associated problems such as theft. and merciless headhunters. 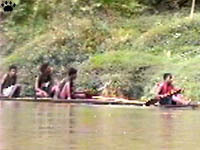 Kinabatangan River. Most frogs of Malaysia belong to flying frog family (Rhyacoforidae), so called because some of its members use enlarged toe webs (central photo) for gliding flights. But there are also true toads (Bufonidae, left photo), true frogs (Ranidae, right photo), and many other groups. Toad (Bufo sp. ), Gunung Mulu. Not surprisingly, it is a popular destination for traveling naturalists. But most people visit Malaysia during relatively dry months (May-September), while in October and November of 2002 I had most forest trails all to myself. More trees were fruiting, more animals were active, and frog choruses after rain were very beautiful. Toad (Bufo sp. ), Gunung Mulu. 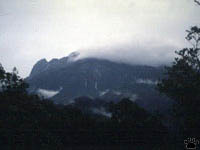 Gunung Mulu. Insects, except butterflies and moths, and mushrooms were particularly abundant and easy to find. G. Mulu. Each night walk through a forest was an endless show of living wonders, most of them small. Mushrooms of Sabah, left to right: unidentified, Ganoderma, Cortinarius, Dictyophora. 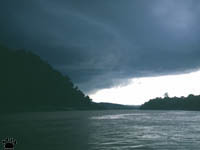 Approaching thunderstorm, Kinabatangan River. The rainy season was just beginning, so it wasn't so bad: evening showers now and then, and clear most of time. Only on Mount Kinabalu did I get twelve hours of nonstop rain, but this place is interesting in any weather. Views of Mount Kinabalu, Sabah. View from Mt. Kinabalu. At about 4,100 m/13,450', Mt. Kinabalu is the highest peak between the Himalaya and New Guinea. Many plants and animals are found nowhere else on Earth, except for a few nearby mountains. Birds of Mount Kinabalu, left to right: Dicrurus hottentotus, D. leucophaeus, Aethopyga temminckii, Dicaeum monticolum, Copsychus striclandi, Pericrocotus solaris. Mt. Kinabalu. 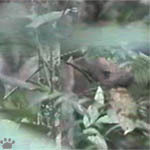 Unlike birds, mammals of Mount Kinabalu are usually difficult to see, and even more difficult to photograph. The rarest one I saw there was Kinabalu black shrew (Suncus ater), previously known from only one specimen (sorry, no picture). Squirrels and tree-shrews are easier to find, but often too fast for good photos. Mt. Kinabalu. Hundreds of endemic plant species include beautiful mosses, about forty oaks, and many coniferous trees. Forests at 1,800 - 2,600 m are probably the most beautiful cloud forests in the world, and they have the highest concentration of endemics. Alpine vegetation at 2,600-3,000 m is also very interesting. Orchids and insectivorous pitcher plants are also particularly diverse in cloud forests. Orchid, Mt. Kinabalu. Orchid, Mt. Kinabalu. Pitcher plants of Mt. Kinabalu, upper row, left to right: Nepenthes rajah, N. albomarginata, N. lowii, N. reinwardtiana, N. ampullaria, N. gracilis, N. burbridgiae, N. fusca, N. bicalcaratum; lower row, left to right: N. villosa, N. rafflesiana, N. pilosa , N. edwardsiana. Among Mt. Kinabalu's ten rhododendron species, Low's rhododendron is the most beautful one. Rhododendron lowii, Mt. Kinabalu. Rhododendron rugosum, Mt. Kinabalu. View from Mt. Kinabalu. The summit of Mount Kinabalu above 3,000 m is less interesting for a biologist - it is an almost barren granite plateau. The views are great, though: most of Sabah can be seen in good weather. Tambunan. The most impressive plants of Bornean mountains are Rafflesia. They occur from Thailand and the Philippines to Sumatra and Java, but all 16 known species are rare and extremely local. Tambunan Rafflesia Reserve on Crocker Ridge, where R. pricei grows, is one of the most accessible places to see them. Gunung Mulu, Sarawak. Lowland forests of Borneo have their own bizarre giant - Vodoo Lily, or Elephant Arum. blooms once in three years. Its composite flowerings are made up of thousands of small flowers, and can be 2 m/6' tall. snakes, lizards, lemurs, and squirrels. Sepilok. Perfectly camouflaged, flying lemurs (Cynocephalus variegatus) are among the largest of gliding animals. 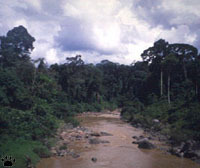 Lowland rainforests have mostly been logged, but there are still some pristine areas. but their fauna is different from lowlands. is Danum Valley Conservation Area, Sabah. wait out the hottest hours of the day. Foam-made frog nest above a rhino wallow. Hatching tadpoles fall in the water below. Danum Valley. Some of the world's rarest animals, such as Sumatran rhino (Dicerorhinus sumatrensis), live in Malaysia's parks. 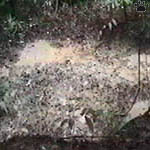 Rhino wallows are used by numerous mammals and birds as watering holes. Greater mouse deer (Tragulus napu) at a rhino wallow, Danum. Diversity of plants and animals in the lowland and hill forests is even higher than in the mountains. Two of Malaysia's 14 barbet species: Calorhampus fuliginosus (left), Megalaima henrichii. Danum Valley. Two of Malaysia's 12 pitta species: Pitta moluccensis (left) and P. sordida. Danum Valley. spend daytime hiding. Danum Valley. The best time to see most rainforest animals, except for a few diurnal groups such as songbirds, dragonflies, and squirrels, is after sunset and before dawn. Frogmouths, civets, tarsiers, some insects and bats are most active around midnight, while deer keep grazing all night. effective insect hunters. Danum Valley. 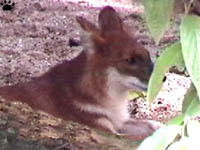 Dhole (Cuon alpinus), photographed in captivity.